에어로 로드 바이크의 새로운 선택, Propel Advanced SL Disc. 초경량의 무게, 최고의 강성을 갖추고 바람을 가르며 달리는 이 카본 로드 바이크는 스프린트와 솔로 라이딩에서 최상의 성능을 발휘합니다. 프레임에는 디스크 브레이크 기술을 적용하여 격렬한 스프린트와 가파른 내리막길에서도 우수한 컨트롤이 가능합니다. 최고의 에어로 로드 퍼포먼스를 위해 세심하게 개발된 이 날렵한 로드 바이크는 스프린트와 솔로 라이딩에 이점을 가지고 있습니다. 프레임은 Advanced 등급의 카본 복합소재를 사용하여 수공으로 제작되었고, 날렵하고 예민한 반응성을 보이는 라이딩 퀄리티, 그리고 가벼운 무게와 최상의 강성을 갖추었습니다. 디스크 브레이크는 프레임에 완전히 일체화되었고, 이 기술을 최적화하기 위해 설계된 플랫 마운트 캘리퍼와 쓰루 액슬을 적용하였습니다. 스프린트에서 솔로 어택, 코너링에서 내리막길까지, 새로운 Propel Advanced Pro Disc는 바람을 가르고 달리며 라이더가 경쟁에서 어드밴티지를 얻을 수 있도록 도울 것입니다. AeroSystem Shaping, a result of CFD analysis and dynamic wind-tunnel testing, optimizes aerodynamic performance at every yaw angle. 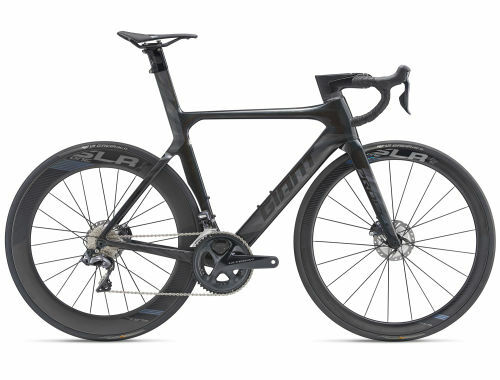 The truncated ellipse airfoil tube shapes and Contact SLR Aero cockpit help produce the best overall aero performance. Integrated disc brakes deliver powerful stopping power and modulation for added control in variable weather. Thru-axles boost stiffness and improve overall handling and an integrated WheelSystem with a 65mm rear rim and 42mm front rim optimizes aerodynamics and control. Advanced SL-grade composite frameset features Giant’s highest performance materials and manufacturing processes for optimized stiffness and the lowest weight in its category. 무게 자전거의 무게를 결정하는 가장 정확한 방법은 지역 대리점에서 측정하는 것입니다. 많은 브랜드가 가능한 가장 낮은 무게를 표시하려고 노력하지만 실제 무게는 크기, 마감재, 하드웨어 및 악세서리 여부에 따라 달라집니다. 모든 GIANT 자전거는 동급 최고의 무게와 주행 품질을 고려하여 설계되었습니다. 나열된 모든 사양은 사전 통보없이 변경 될 수 있습니다. Developed and proven by some of the fastest sprinters in the pro peloton, the new Propel Advanced SL Disc delivers ultimate speed through integrated aerodynamics. It’s engineered with Giant’s AeroSystem Shaping technology, which means every tube shape and angle is optimized for minimal drag. These tubes feature a “truncated ellipse” shape, which also result in a frame that is ultra-stiff and superlight. Disc-brake technology is integrated into the frameset with flat-mount calipers and thru-axles for optimal wheel stiffness and braking performance. For pro-level road performance and the ultimate aero advantage, the new Propel Advanced SL Disc puts you way ahead of the pack. Through CFD (Computational Fluid Dynamics) and wind-tunnel data, engineers optimize each tube shape to deliver superior aerodynamic performance. Designed as a key performance factor in the overall frameset, the integrated seatpost saves up to 45 grams compared to standard composite posts, while improving aerodynamics and adding road-smoothing compliance. Giant's Professional Grade carbon material is woven in our own composite factory using a proprietary resin formula and our most advanced engineering and construction methods including: Continuous Fiber Technology, CNT Technology and Fusion Process. Giant’s most advanced steerer tube technology offers unprecedented steering precision. Oversized headset bearings (1 1/2” lower, 1 1/4” upper) and a tapered steerer tube produce superior front-end stiffness. A massively oversized bottom-bracket/chainstay area features a fully integrated, 86-millimeter wide bottom-bracket design. Asymmetric chainstays provide additional stiffness on the driveside and stability on the non-driveside. Giant’s chainstay integrated, wireless data transmitter. The removable transmitter sends wheel speed and cadence information directly to any ANT+ compatible computer. Engineered with proprietary Dynamic Balanced Lacing technology, this composite SLR Aero WheelSystem features different rim depths front and rear to minimize drag without compromising stability. The rear has a 65mm rim for uncompromising aero performance and power transmission. The front has a shallower 42mm rim for added control in crosswinds. The wheels are integrated with Giant Gavia tubeless tires for added rolling efficiency and a reduced risk of flats. Frame/handlebar/stem feature unique cable porting for sleek, non-cluttered appearance and performance. The frame and fork are engineered specifically for flat-mount disc-brakes, including front and rear 12mm thru-axles for reliable braking performance in all weather and road conditions. Composite integrated handlebar-and-stem unit improves aero performance with wind-tunnel shaped airfoil design and internal cable routing. 사이즈표는 참고용이며, GIANT 또는 Liv 대리점과 상담, 문의하여 정확한 사이즈를 확인하시기 바랍니다. 적용 가능한 범위는 국가마다 다를 수 있습니다. 카본 원사부터 완성된 프레임까지, 모든 GIANT 카본 자전거는 자체 공장에서 디자인되고 설계되며, 수작업을 통해 생산됩니다. 최첨단 소재와 제조 기술을 이용하여 만들어진 Advanced SL 등급 카본 프레임은 가볍고 견고하며, 우수한 컴플라이언스를 제공합니다. GIANT 기술자들은 에어로 다이나믹 퍼포먼스를 향상시키기 위해 CFD와 윈드터널 데이터를 이용하여 각 튜브의 형태를 최적화하였습니다. GIANT 자전거에 적용된 최신의 스티어러 튜브 기술입니다. 뛰어난 프론트 엔드 스티어링 성능을 발휘하도록 고안된 이 시스템은 대구경 헤드셋 베어링(상단 1 1/4’, 하단 1 1/2’)과 테이퍼 형상의 스티어러 튜브가 접합부에서 작동하여 최적화된 스티어러 강성을 제공합니다. GIANT의 체인스테이와 결합된 무선 데이터 전송기입니다. 탈부착이 가능한 이 무선 전송기는 바퀴의 회전속도와 페달링(케이던스) 정보를 모든 종류의 ANT+ 호환 속도계에 직접 전송합니다. 낮은 공기 압력으로 달릴 수 있는 튜브리스 림은 타이어가 도로 지면과 지형에 더 잘 순응하게 만들어 접지력을 향상시키고 회전력 저항을 낮추었으며, 펑크 위험을 감소시킵니다.